The dog grooming brush starts with the 12 teeth side for stubborn tangles and matts. Finish with the 23 teeth side for thinning and deshedding to reach the best grooming result . The dog deshedding brush examines pet coat and look for tangles, which makes it safer for pet skin. Dog deshedding brush gently break out the matt and brush it out with the grooming tool. Perfectly suits for dogs, cats, rabbits, horses and most hairy pets. 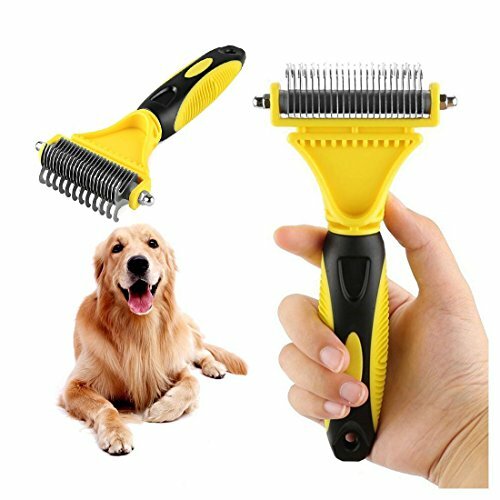 2 IN 1 SET-- You will get one pet grooming comb! Suitable for dogs and cats to remove mats tangles and knots. DUAL HEAD - Start with 12 teeth side for stubborn mats and tangles and finish with 23 teeth side for thinning and deshedding. Achieve faster and more professional dematting and grooming results! SAFE & EASY TO USE--No-scratch rounded outside teeth gently massage the pet skin. Meanwhile, teeth inner side is sharp enough to smoothly cut through the toughest mats, tangles and knots. DURABLE & EASY TO CLEAN-- No-rust stainless steel teeth of the pet dematting comb are durable and easy-to clean. With the dog grooming brush, don't need to worry your pet' s hair will mess your house any more! If you have any questions about this product by Goldsen, contact us by completing and submitting the form below. If you are looking for a specif part number, please include it with your message.